This week, Angie puts a spotlight on Jim Gaffigan. If you or your comedy troupe would like to be featured on Stand-Up Tuesdays, please email utgjames@gmail.com. This week in Stand Up Tuesdays, we’re going to enjoy the self-released awesomeness that is Jim Gaffigan’s Mr. Universe, mainly because receiving the hard copy CD served to remind me that I’ve simply not yet featured Gaffigan – which in itself is a crime of some kind, I’m sure. I’m also quite confused as to how the special actually found its way onto CD. 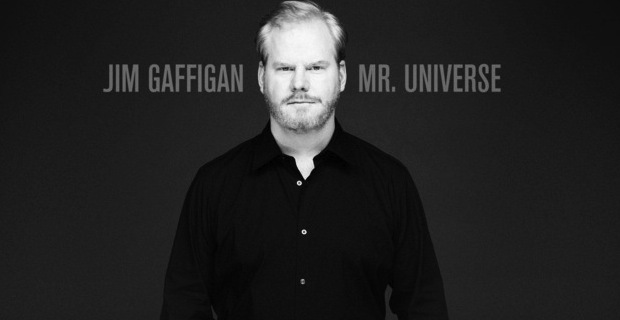 Following in the footsteps of Louis C.K., Gaffigan released Mr. Universe in April 2012 as a direct-to-consumer effort that is available to fans for only $5 (and, much like C.K., fans can do just about whatever they please with the download, as there are no limitations or restrictions). While Gaffigan promised that the special would only be available via this method, Comedy Central has now taken the baton and plan to release Mr. Universe on CD and digital album on August 28. While I’ve probably never questioned a stand-up move made by Comedy Central, one can’t help but wonder why, after only four months of direct-to-fans availability, the label has decided to uproot this effort by mass-producing the special for market. Don’t get me wrong, Gaffigan is responsible for some of the funniest and most memorable moments in recent comedy and has seen huge success with his first three albums – “Doing My Time,” “Beyond the Pale,” and “King Baby.” Gaffigan’s first three Comedy Central albums combined have sold in excess of 500,000 copies and he is one of the top comics touring today, selling out multiple nights at huge theaters across the country. He’s one of the most original and entertaining comedians performing today who also happens to be a rather clean comic – something that can be somewhat surprising with a joke entitled, “ExtenZe”. Mr. Universe offers Gaffigan musing, in typical Gaffigan form, about everything from having a fourth child and (not) working out to how fat whales are for animals who constantly ‘work out’ by swimming to fast food outlets of all kinds. The special is a fitting summation of where Gaffigan is at in his life – a father of four whose life is now dominated by diaper changes and family vacations to Disney. As Gaffigan gets older, though, don’t expect his humor to slow down in any way – he’s still more than able to point out the utter absurdity of the world around him. If you haven’t already enjoyed Jim Gaffigan’s Mr. Universe (which only cost $5 on Gaffigan’s website with $1 per download going to the Bob Woodruff Foundation, helping veterans and their families and has been out since April), you’re already behind in the game. But, for some reason, if you haven’t yet familiarized yourself with Gaffigan’s work or his latest effort, you’re going to want to get on the bandwagon immediately. Jim Gaffigan remains one of the most talented and entertaining comedians that can be seen and heard today, and Mr. Universe is no exception. The CD and digital album will be released via Comedy Central Records on August 28.